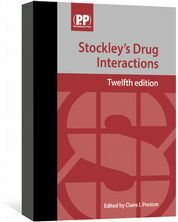 The 2016 Stockley's pocket guide to drug interactions and their management, for the busy healthcare professional. Claire L Preston is one of the Editors of Stockley’s Drug Interactions and works at the Royal Pharmaceutical Society, UK. 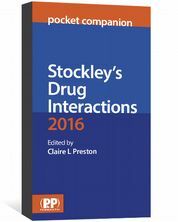 Stockley’s Drug Interactions Pocket Companion 2016 is a portable, easy-to-use, A–Z guide to common drug interactions. This new edition is based on the latest updates of Stockley’s Drug Interactions and offers evidence-based guidance on the management of common drug–drug, drug–herb, and drug–food interactions. Severity rating symbols to indicate the clinical significance of each interaction. Presented in the familiar style of the Stockley family of products, the quick-reference format makes this an essential clinical reference for physicians, pharmacists, nurses, and other healthcare professionals. 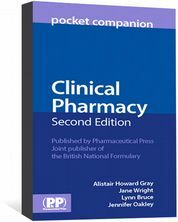 ...On the wards, but also when doing medication reviews, this Pocket Companion comes in very handy."